For other uses, see Philo (disambiguation). Philo of Alexandria (/ˈfaɪloʊ/; Ancient Greek: Φίλων, translit. Phílōn; Hebrew: יְדִידְיָה הַכֹּהֵן‎, translit. Yedidia (Jedediah) HaCohen; c. 20 BCE – c. 50 CE), also called Philo Judaeus, was a Hellenistic Jewish philosopher who lived in Alexandria, in the Roman province of Egypt. Philo used philosophical allegory to harmonize Jewish scripture, mainly the Torah, with Greek philosophy. His method followed the practices of both Jewish exegesis and Stoic philosophy. His allegorical exegesis was important for some Christian Church Fathers, but he had very little reception history within the Rabbinic Judaism. He adopted allegorical instead of literal interpretations of the Hebrew Bible. Some scholars hold that his concept of the Logos as God's creative principle influenced early Christology. Other scholars deny direct influence but say that Philo and Early Christianity borrow from a common source. The only event in Philo's life that can be decisively dated is his participation in the embassy to Rome in 40 CE. He represented the Alexandrian Jews in a delegation to the Roman Emperor Gaius (Caligula) following civil strife between the Alexandrian Jewish and Greek communities. The story of this event, and a few other biographical details, are found in Josephus and in Philo's own works, especially in Legatio ad Gaium (Embassy to Gaius) of which only two of the original five volumes survive.. 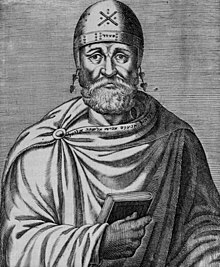 The thought of Philo was largely inspired by Aristobulus of Paneas and the Alexandrian School, concerning his work "Wisdom of Solomon" and the occupations of the Therapeutæ and the Essenes. Philo has never been claimed as a saint nor Doctor of the Church. Philo was probably born with the name Julius Philo. His ancestors and family were contemporaries to the rule of the Ptolemaic dynasty and the rule of the Seleucid Empire. Although the names of his parents are unknown, Philo came from a family which was noble, honourable and wealthy. It was either his father or paternal grandfather who was granted Roman citizenship from Roman dictator Gaius Julius Caesar. Jerome wrote that Philo came "de genere sacerdotum" (from a priestly family). His ancestors and family had social ties and connections to the priesthood in Judea, the Hasmonean dynasty, the Herodian dynasty and the Julio-Claudian dynasty in Rome. Philo had two brothers, Alexander the Alabarch and Lysimachus. Through Alexander, Philo had two nephews Tiberius Julius Alexander and Marcus Julius Alexander. The latter was the first husband of the Herodian princess Berenice. Marcus died in 43 or 44. Philo visited the Second Temple in Jerusalem at least once in his lifetime. Philo would have been a contemporary of Jesus and his Apostles. Philo along with his brothers received a thorough education. They were educated in the Hellenistic culture of Alexandria and Roman culture, to a degree in Ancient Egyptian culture and particularly in the traditions of Judaism, in the study of Jewish traditional literature and in Greek philosophy. Philo's dates of birth and death are unknown but can be judged by Philo's description of himself as "old" when he was part of the delegation to Gaius Caligula in 38 CE. Jewish history professor Daniel R. Schwartz estimates his birth year as sometime between 20 and 10 BCE. Philo's reference to an event under the reign of Emperor Claudius indicates that he died sometime after 41 CE. In Legatio ad Gaium (Embassy to Gaius), Philo describes his diplomatic mission to Gaius Caligula, one of the few events in his life which is known specifically. He relates that he was carrying a petition describing the sufferings of the Alexandrian Jews and asking the emperor to secure their rights. Philo gives a description of their sufferings, more detailed than Josephus's, to characterize the Alexandrian Greeks as the aggressors in the civil strife that had left many Jews and Greeks dead. Philo lived in an era of increasing ethnic tension in Alexandria, exacerbated by the new strictures of imperial rule. Some expatriate Hellenes in Alexandria condemned the Jews for a supposed alliance with Rome, even as Rome was seeking to suppress Jewish nationalism in Judea. In Against Flaccus, Philo describes the situation of the Jews in Egypt, writing that they numbered not less than a million and inhabited two of the five districts in Alexandria. He recounts the abuses of the prefect Aulus Avilius Flaccus, who he says retaliated against the Jews when they refused to worship Caligula as a god. Daniel Schwartz surmises that given this tense background it may have been politically convenient for Philo to favor abstract monotheism instead of overt pro-Judeanism. Philo considers Caligula's plan to erect a statue of himself in the Second Temple to be a provocation, asking, "Are you making war upon us, because you anticipate that we will not endure such indignity, but that we will fight on behalf of our laws, and die in defence of our national customs? For you cannot possibly have been ignorant of what was likely to result from your attempt to introduce these innovations respecting our temple." In his entire presentation, he implicitly supports the Jewish commitment to rebel against the emperor rather than allow such sacrilege to take place. Philo says he was regarded by his people as having unusual prudence, due to his age, education, and knowledge. This indicates that he was already an older man at this time (40 CE). In Antiquities of the Jews, Josephus tells of Philo's selection by the Alexandrian Jewish community as their principal representative before the Roman emperor Gaius Caligula. He says that Philo agreed to represent the Alexandrian Jews in regard to civil disorder that had developed between the Jews and the Greeks. Josephus also tells us that Philo was skilled in philosophy, and that he was brother to the alabarch Alexander . According to Josephus, Philo and the larger Jewish community refused to treat the emperor as a god, to erect statues in honor of the emperor, and to build altars and temples to the emperor. Josephus says Philo believed that God actively supported this refusal. There was now a tumult arisen at Alexandria, between the Jewish inhabitants and the Greeks; and three ambassadors were chosen out of each party that were at variance, who came to Gaius. Now one of these ambassadors from the people of Alexandria was Apion, (29) who uttered many blasphemies against the Jews; and, among other things that he said, he charged them with neglecting the honors that belonged to Caesar; for that while all who were subject to the Roman empire built altars and temples to Gaius, and in other regards universally received him as they received the gods, these Jews alone thought it a dishonorable thing for them to erect statues in honor of him, as well as to swear by his name. Many of these severe things were said by Apion, by which he hoped to provoke Gaius to anger at the Jews, as he was likely to be. But Philo, the principal of the Jewish embassage, a man eminent on all accounts, brother to Alexander the Alabarch, (30) and one not unskillful in philosophy, was ready to betake himself to make his defense against those accusations; but Gaius prohibited him, and bid him begone; he was also in such a rage, that it openly appeared he was about to do them some very great mischief. So Philo being thus affronted, went out, and said to those Jews who were about him, that they should be of good courage, since Gaius's words indeed showed anger at them, but in reality had already set God against himself. This event is also described in Book 2, Chapter 5 of Eusebius' Ecclesiastical History. Some of Philo's works have been preserved in Greek, while others have survived through Armenian translations, and a smaller amount survives in a Latin translation. Exact date of writing and original plan of organization is not known for much of the text attributed to Philo. Quaestiones ("Inquiries") – short verse-by-verse exposition: four books on the Book of Genesis and two on the Book of Exodus. All six books are preserved through an Armenian translation, which was published by Jean-Baptiste Aucher in 1826. Comparison with surviving Greek and Latin fragments recommends the translation as literal and accurate so far as it goes, but suggests that some of the original content is missing. There are thought to be twelve original books, six on Genesis and six on Exodus. Allegoral Commentary – longer exegesis explaining esoteric meanings; the surviving text deals only with the Book of Genesis, with the notable omission of the Genesis 1. "Exposition of the Law" – more straightforward synthesis of topics in the Pentateuch, probably written for gentiles as well as Jews. Apologies for Judaism including On the Life of Moses, On the Jews, and On the Contemplative Life. Historical works (describing current events in Alexandria and the Roman Empire), including Against Flaccus and Embassy to Gaius. Philosophical works including Every Good Man Is Free, On the Eternity of the World, On Animals, and On Providence, the latter two surviving only through Armenian translation. Philo represents the apex of Jewish-Hellenistic syncretism. His work attempts to combine Plato and Moses into one philosophical system. His ethics were strongly influenced by Aristotelianism and Stoicism, preferring a morality of virtues without passions, such as lust/desire and anger, but with a "common human sympathy". Philo bases his doctrines on the Hebrew Bible, which he considers as the source and standard not only of religious truth but of all truth. [a] Its pronouncements are the ἱερὸς λόγος, θεῖος λόγος, and ὀρθὸς λόγος (holy word, godly word, righteous word), uttered sometimes directly and sometimes through the mouth of a prophet, and especially through Moses, whom Philo considers the real medium of revelation. Although he distinguishes between the words uttered by God Himself, as the Decalogue, and the edicts of Moses, as the special laws, he does not carry out this distinction, since he believes in general that everything in the Torah is of divine origin, even the letters and accents. Philo regards the Bible as the source not only of religious revelation, but also of philosophic truth; for, according to him, the Greek philosophers also have borrowed from the Bible: Heraclitus, according to "Quis Rerum Divinarum Heres Sit" § 43 [i. 503]; and Zeno,[disambiguation needed] according to "Quod Omnis Probus Liber", § 8 [ii. 454]. Philo's allegorical interpretation of scripture allows him to grapple with morally disturbing events and impose a cohesive explanation of stories. Specifically, Philo interprets the characters of the Bible as aspects of the human being, and the stories of the Bible as episodes from universal human experience. For example, Adam represents the mind and Eve the senses. Noah represents tranquility, a stage of "relative" (incomplete but progressing) righteousness. In brief: Philo affirms a transcendent God without physical features or emotional qualities resembling those of human beings. In Philo, God exists beyond time and space and does not make special interventions into the world because He already encompasses the entire cosmos. Philo's notion is even more abstract than that of the Monad of Pythagoras or the Good of Plato. Only God’s existence is certain, no appropriate predicates can be conceived. Following Plato, Philo equates matter to nothingness and sees its effect in fallacy, discord, damage, and decay of things. This view enables Philo to combine the Jewish belief in creation with the Greek conviction about the formation of all things from the permanent matter. Philo seems to look at man as a trichotomous mind/spirit-soul-body, common to the Hellenistic view of mind-soul-body. In Philo's writings, however, mind and spirit are used interchangeably..
Philo wrote that God created and governed the world through mediators. Logos is the chief among them, the next to God, demiurge of the world. Logos is immaterial, an adequate image of God, his shadow, his firstborn son. Being the mind of the Eternal, Logos is imperishable. He is neither uncreated as God is, nor created as men are, but occupies a middle position. He has no autonomous power, only an entrusted one. Philo probably was the first philosopher who identified Plato’s Ideas with Creator’s thoughts. These thoughts make the contents of Logos; they were the seals for making sensual things during world creation. Logos resembles a book with creature paradigms. An Architect’s design before the construction of a city serves to Philo as another simile of Logos. Since creation, Logos binds things together. As the receptacle and holder of ideas, Logos is distinct from the material world. At the same time, Logos pervades the world, supporting it. Logos has the function of an advocate on behalf of humanity and also that of a God’s envoy to the world. He puts human minds in order. The right reason is an infallible law, the source of any other laws. The angel closing Balaam’s way (Numbers XXII, 31) is interpreted by Philo as manifestation of Logos, which acts as man’s conscience. Philo frequently engages in Pythagorean-inspired numerology, explaining at length the importance of religious numbers such as six, seven, and ten. Commentators can infer from his mission to Caligula that Philo was involved in politics. However, the nature of his political beliefs, and especially his viewpoint on the Roman Empire, is a matter of debate. Philo was more fluent in Greek than in Hebrew and read the Jewish Scriptures chiefly from the Septuagint, a Koine Greek translation of Hebraic texts later compiled as the Hebrew Bible and the Deuterocanonical books. The Septuagint translates the phrase מַלְאַךְ יְהוָה (Malakh YHWH, lit. "Messenger of Yahweh") as ἄγγελος Κυρίου (ángelos Kyríou, lit. "angel of the Lord"). Philo identified the angel of the Lord (in the singular) with the Logos. Peter Schäfer argues that Philo's Logos was derived from his understanding of the "postbiblical Wisdom literature, in particular the Wisdom of Solomon". The Wisdom of Solomon is a Jewish work composed in Alexandria, Egypt, around the 1st century CE, with the aim of bolstering the faith of the Jewish community in a hostile Greek world. It is one of the seven Sapiential or wisdom books included within the Septuagint. The extent of Philo's knowledge of Hebrew is debated. His numerous etymologies of Hebrew names—which are along the lines of the etymologic midrash to Genesis and of the earlier rabbinism, though not modern Hebrew philology—suggest some familiarity. Philo offers for some names three or four etymologies, sometimes including the correct Hebrew root (e.g., יָרַד‎, yarád, lit. "(to) descend" as the origin of the name Jordan). However, his works do not display much understanding of Hebrew grammar, and they tend to follow the translation of the Septuagint more closely than the Hebrew version. For a long time, Philo was read and explained mostly by Christian authors. Azariah dei Rossi's Me'or Enayim: Imre Binah (1575), one of the first Jewish commentaries on Philo, describes four "serious defects" of Philo: reading the Torah in Greek, not Hebrew; belief in primordial matter rather than creatio ex nihilo; unbelief in the Lord as evidenced by excessively allegorical interpretation of scripture; and neglect of the Jewish oral tradition. Dei Rossi later gives a possible defense of Philo and writes that he can neither absolve or convict him. Cohn, Leopold & Paul Wendland, Philonis Alexandrini Opera quæ supersunt (The Surviving Works of Philo of Alexandria) [Greek and Latin]. Berlin: George Reimer. Terian, Abraham, ed. (1981). Philonis Alexandrini de animalibus: The Armenian Text with an Introduction, Translation, and Commentary. Chico, CA: Scholars Press. ISBN 9780891304722. ^ The extent of his canon cannot be exactly determined. He does not quote the Books of Ezekiel, Daniel, Canticles, Ruth, Lamentations, Ecclesiastes, or Esther. ^ Hillar, Marian. "Philo of Alexandria (c. 20 B.C.E.—40 C.E.)". Internet Encyclopedia of Philosophy. Retrieved 2018-09-11. ^ Keener, Craig S (2003). The Gospel of John: A Commentary. 1. Peabody, Mass. : Hendrickson. pp. 343–347. ^ "Jewish Hellenistic Philosopher Aristobolus of Alexandria". earlyjewishwritings.com. ^ "Aristobulus of Paneas". Britannica.com. Archived from the original on Oct 30, 2017. Retrieved Aug 19, 2018. ^ a b "Philo Judæus". newadvent.org. Archived from the original on Jan 29, 2018. Retrieved Aug 19, 2018. ^ Jerome, De Viris Illustribus (e-text), Caput XI (English translation). ^ a b c d Daniel R. Schwartz, "Philo, His Family, and His Times", in Kamesar (2009). ^ In addition to the familiar texts that form the Hebrew Bible, the Mishnah (or rather the oral Jewish law, since the Mishnah was first redacted and written down in 220AD) and a range of non-canonical literature. ^ Josephus, Antiquities xviii. 8. 1. ^ a b c James R. Royse, with Adam Kamesar, "The Works of Philo", in Kamesar, ed. (2009). ^ Moore, Edward (June 28, 2005). "Middle Platonism – Philo of Alexandria". The Internet Encyclopedia of Philosophy. ISSN 2161-0002. Retrieved December 20, 2012. Crawford Howell Toy; Carl Siegfried; Jacob Zallel Lauterbach (1901–1906). "Philo Judaeus: His Methods of Exegesis". In Singer, Isidore; et al. (eds.). The Jewish Encyclopedia. New York: Funk & Wagnalls. .
^ Sandmel (1979), p. 24–25; 84–85. ^ David T. Runia, "The Idea and the Reality of the City in the Thought of Philo of Alexandria"; Journal of the History of Ideas 61(3), July 2000. ^ Goodenough (1983), pp. 1–3. ^ De somniis ii, 81–91; quoted in Goodenough (1938), pp. 5–6. ^ a b Daniel R. Schwartz, "Philo, His Family, and His Times", in Kamesar (2009), p. 18. "At a very early stage, the use of Hebrew seems to have declined and the language of the Jews of Alexandria came to be Greek exclusively. The translation of the Torah (and in time the other books) allowed Greek to be a vehicle for Jewish culture. Indeed, there developed a very rich Jewish literature in Greek already in the second century BCE. By the time of the era of Philo, it is hardly surprising that he was a highly accomplished Greek stylist, and probably knew little to no Hebrew." ^ Hugh Pope, Catholic Encyclopedia 1907 "Angels"
^ Frederick Copleston, A History of Philosophy, Volume 1, Continuum, 2003, p. 460. ^ J.N.D. Kelly, Early Christian Doctrines, 5th ed., HarperOne, 1978, p. 11. ^ Schäfer, Peter (24 January 2011). The Origins of Jewish Mysticism. Princeton University Press. p. 159. ISBN 0-691-14215-7. It is more than likely that Philo knew the postbiblical Wisdom literature, in particular the Wisdom of Solomon. and was influenced by it. The obvious identification of Logos and Wisdom in the Wisdom of Solomon is a case in point. Wisdom (Greek sophia) plays a prominent role in Philo as well and is yet another power among the divine powers that acts as an agent of creation. Whereas the Logos, as we have seen, is responsible for the intelligible world, Wisdom would seem to be responsible for the world perceived by the senses. ^ "Philo Judaeus: His Knowledge of Hebrew". Jewish Encyclopedia. 1901–1906. ^ Anthony Hanson, "Philo's Etymologies"; Journal of Theological Studies 18, 1967; pp. 128–139. ^ Naomi G. Cohen, "Philo Judaeus and the True Torah Library"; Tradition: A Journal of Orthodox Jewish Thought 41(3), Fall 2008. Borgen, Peder (1997). Philo of Alexandria: An Exegete for His Time. Leiden: Brill. ISBN 9789004103887. Goodenough, Erwin R. (1938). The Politics of Philo Judaeus: Practice and Theory. With a General Bibliography of Philo by Howard L. Goodhart and Erwin R. Goodenough. Yale University Press. Hillar, Marian (2012). From Logos to Trinity: The Evolution of Religious Beliefs from Pythagoras to Tertullian. New York: Cambridge University Press. ISBN 9781107013308. Runia, David T. (1986). Philo of Alexandria and the Timaeus of Plato. Philosophia antiqua, 44. Brill, Leiden. Runia, D. T. (1990). Exegesis and Philosophy: Studies on Philo of Alexandria. Variorum. ISBN 9780860782872. Runia, D. T. (1993). Philo in Early Christian Literature: A Survey. Minneapolis: Fortress Press. ISBN 9789023227137. Runia, D. T. (2001). On the Creation of the Cosmos according to Moses. Number 1 in Philo of Alexandria Commentary Series. Brill, Leiden. Sandmel, Samuel. (1979). Philo of Alexandria: An Introduction. Oxford University Press. ISBN 0-19-502514-8. Sly, Dorothy I. (1996). Philo's Alexandria. New York: Routledge. ISBN 9780415096799. Lévy, Carlos (February 6, 2018). "Philo of Alexandria". Stanford Encyclopedia of Philosophy. Hillar, Marian (April 21, 2005). "Philo of Alexandria (c. 20 B.C.E.—40 C.E.)". Internet Encyclopedia of Philosophy. "Preface to the Original Edition of Yonge's Translation". earlyjewishwritings.com. 1854–1855. Crawford Howell Toy; Carl Siegfried; Jacob Zallel Lauterbach (1901–1906). "Philo Judæus". In Singer, Isidore; et al. (eds.). The Jewish Encyclopedia. New York: Funk & Wagnalls. Bréhier, Emile (1911). "Philo Judæus". The Catholic Encyclopedia. 12. New York: Robert Appleton Company. 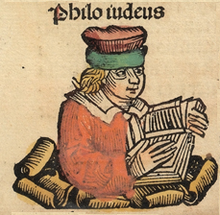 "Philo Judaeus (Jewish philosopher)". Encyclopædia Britannica. "Studia Philonica Annual". Society of Biblical Literature. Bradshaw, Rob. "Philo of Alexandria". EarlyChurch.org.uk. Seland, Torrey. "Philo Resource Page 3.1". torreys.org. Seland, Torrey. "Philonica et Neotestamentica". bibicalresources.wordpress.com. Open source XML versions of Philo's works have been made available by the Open Greek and Latin Project at the University of Leipzig. English translations of Philo's writings are also available here.